Posted August 24, 2016 by Rabbi Lebow & filed under Advice. When planning a wedding, there are many decisions to make, but one of the most sacred and symbolic is your choice of wedding rings. Something most couples don’t take lightly, the perfect rings to symbolize your love and unity can take on many forms. Recently, Brides reported on a new trend that features multiple stacked rings has been caught in the limelight as a unique way to symbolize marriage. Since interfaith couples are often looking for ways to blend and combine their traditions and beliefs, stacked rings is the perfect way to represent a merger of faiths and traditions. What is wonderful about stacked rings is that they can represent whatever you would like! Many couples like to have two rings – representing themselves as individuals – and a third ring to represent their combined lives together. Another option would be to use your engagement ring as representation of your life before your marriage commitment, your wedding band to symbolize your commitment to matrimony and add additional rings for each child you have showing how you have combined your faiths to make a family. With the beautiful symbolism of stacked rings, you can find yet another way to celebrate both of your faiths and your marriage. In addition to what each ring represents, stacked rings are versatile in that they allow for the wearer to display his or her personality. From incorporating extra sparkle with dazzling gems to mixing and matching different metals, the flexibility with stacked rings allows you to make a unique statement. You can even add different textures or thickness according to what style and symbolism you would like to convey. This new trend is making it easier for interfaith couples to express themselves and their individuality and combined life together. 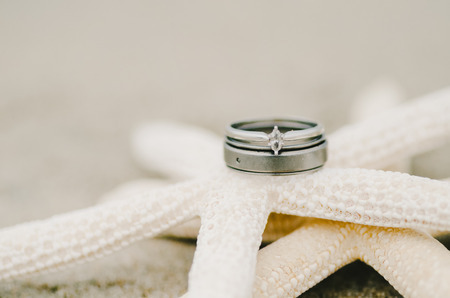 In addition to stacked rings to represent your love, you can also work with Rabbi Lebow to create a ceremony that also combines your specific requests to create a blended celebration that merges your faiths and interests. Rabbi Lebow is excited and honored to be a part of your wedding day and will work with you to create a ceremony that will express your values and needs, and if you choose stacked rings, I can even be incorporate their unique meanings into the ceremony itself! To learn more about my officiant services or to discuss your ideas for the perfect interfaith wedding ceremony, call me today at 404-790-8612. Posted August 2, 2016 by Rabbi Lebow & filed under Atlanta Weddings. Modern weddings are a beautiful combination of traditions from many faiths, ethnicities and cultures. When saying “I do,” brides and grooms have endless options to tailor their special day to fit their wants and needs. Unlike the strict wedding planning rules of the past, the modern wedding can be based on a heart-felt, culturally sensitive ceremony – as was the case with Erica and Rob, an interfaith couple recently profiled by Modern Jewish Wedding. For the couple’s unique ceremony, the bride’s Jewish heritage and the groom’s Jamaican roots were delightfully blended to create a cultural mix their guests could relate to. Erica and Rob included stomping on a wine glass and jumping the broom, but they also included their son, Jordan, in the ceremony by having him join them under the chuppah during the ceremony. Planning a modern, interfaith wedding like the one held by Erica and Rob can be stressful – just like planning any wedding – but when selecting a interfaith rabbi and officiant, Rabbi Lebow is the perfect choice for you. He can help you plan a wedding ceremony that is as stress free and as enjoyable as possible while incorporating your unique desires and religious needs. Rabbi Lebow is honored to serve as an officiant for your Jewish, interfaith or LGBT wedding ceremony. He believes a wedding day is about two hearts coming together, and will work with you to create a ceremony you feel comfortable with – without a specific set religious agenda. When you meet with Rabbi Lebow, you will discuss your values and needs to create an inclusive, artful ceremony you will both cherish and love as much as you do one another. Rabbi Lebow feels that it is important to “Always keep the bride smiling,” which is why he is considered one of the top interfaith rabbis in Georgia and surrounding states. Learn more about Rabbi Lebow and schedule an appointment to talk about your wedding ceremony today by calling 404-790-8612. Posted May 20, 2016 by Rabbi Lebow & filed under Advice. Maintaining successful romantic relationships can be tricky and complicated, and now that everyone is constantly plugged into their smartphones, it’s not getting any easier. Baylor University recently did a study that showed that smartphones can be damaging to relationships, and can even cause more pronounced depression. The study focused on surveying about 450 adults about smartphone use while in the presence of their significant other. When one person felt that their partner was distracted from or disinterested in them in favor of their smartphone, conflict ensued, which caused lower levels of relationship satisfaction. This lowered level of satisfaction eventually led to overall life dissatisfaction and even depression. We are all guilty of checking our phones and scrolling through social media sites when we’re meant to be spending time with other people. Scientific American has reported that just having your cellphone nearby – not necessarily holding it or even looking at it – when engaging in a conversation with someone else can lead to a lower level of connectedness, interest and closeness. In theory, smartphones act as conduits to people who are not able to sit next to us, so shouldn’t they bolster relationships by keeping people in touch and making it easier to communicate? In reality, while smartphones may help you keep in touch with someone who lives far away, they usually act as distractions from what’s going on right in front of you. If we’re not careful, this lack of interest and connectedness can lead to serious issues in relationships, especially romantic ones. When a couple that would typically spend Sunday afternoon engaged in conversation or some activity instead spends it sitting on the couch staring at their phones, partners may begin to feel unfulfilled by their relationship. So how do we prevent that from happening to us? Make time for your partner away from television screens, computers and smartphones. Set aside a specific period of time when you will spend time together, unattached to your phones. Make this a common occurrence – at least once per day. If you always eat dinner together, for example, put your cellphones in another room during dinnertime. Make the bedroom a smartphone-free zone, too. Leave your phones in the kitchen and invest in an old-fashioned alarm clock. (Give your friends and family your home phone number to be used in case of emergencies.) With the smartphones out of the picture, you won’t have anything to distract you from asking each other how the day was, and reestablishing the connection that you had at the beginning of your relationship. Keep these ideas in mind, and your relationship will not fall prey to disinterest and dissatisfaction that can be caused by the constant presence of smartphones. Check out our other blog posts for more advice on successfully maintaining healthy and rewarding relationships. Posted April 20, 2016 by Rabbi Lebow & filed under Advice, Atlanta Weddings. In the digital era, establishing and maintaining long-distance relationships proves extremely common as people meet and fall in love online. Though the idea of a long-distance relationship may seem idealistic or unfathomable at first glance, the technology of today helps these increasing numbers of long-distance relationships grow and thrive. Whether you already had an established relationship before it became long-distance (for example, if one of you moved away) or you recently met someone online, forming and keeping intimacy in long-distance relationships is truly easier than ever. Talk to your significant other daily through phone calls, texting, emailing, Facebook messaging, etc. In the average relationship, you typically see or speak with your partner every day. However, in a long-distance relationship, the “seeing” aspect disappears, and so when you start skipping days and go without talking, this could feel like commitment to the relationship is lacking. Simply sending a few texts throughout the day or commitment to a 10-minute daily phone call goes a long way – especially in a long-distance relationship. Especially because you are not physically around each other, trust is huge in a long-distance relationship and resisting temptations should be high on your priority list. If you chose to engage in a long-distance relationship, it is typically because you feel pretty strongly about your significant other. Having an item that always reminds you of this person can serve as an anchor to keep your focus strong. It may be that your wear your partner’s sweatshirt or keep a picture of them in your wallet or purse. Trust takes time, but the quicker and stronger you can build a solid foundation, the better. Depending on your relationship, physical intimacy could be extremely important, but you do not have to forgo such intimacy because you are not physically together. Rather, find a way to include intimacy in your relationship in a fun and exciting way you both enjoy. For example, engaging in video calls or sending flirty messages to your partner are two ways to keep the fire burning while you’re in different parts of the country (or world). Find a TV show you can both enjoy and watch it together via video call or phone call (bonus: if you use Netflix or DVR, time zone differences will not matter). You could also read a book together and chat about it weekly or play board games over a video call. Get creative and come up with some activities you can do as a couple that you would do in person if you could. With the amount of technology available today, nothing is off-limits! Long-distance relationships take commitment, trust, extra effort and commitment to intimacy. But the most important thing is, when you and your partner really want it to, long-distance relationships can be very successful. Of course, if you’re planning to take your long-distance relationship to the next level, one couples activity could be planning your nuptials. 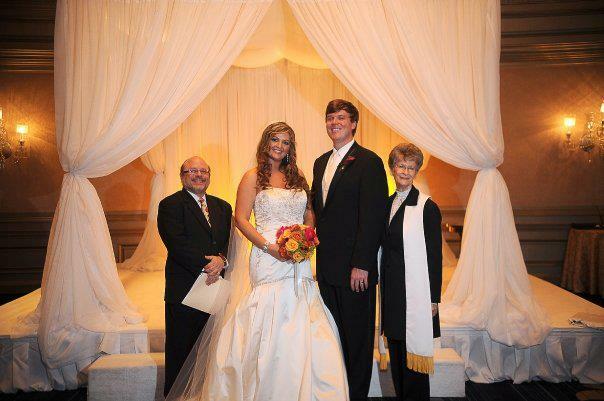 At Atlanta Jewish & Interfaith Weddings, I can help you plan the arrangements and details as your wedding officiant. Call me today at 404-790-8612 to learn more! Posted February 29, 2016 by Rabbi Lebow & filed under Atlanta Weddings. Contrary to what you might see on the news, love is everywhere nowadays. You log onto Facebook and you will see uplifting news of an old friend getting married. Uplifting might be the wrong choice of words – more disheartening depending on the friend or where you’re at in life. When it comes to love, social media is a double-edged sword – some stories might lift your heart up to the stratosphere, others not so much. Sometimes it feels you’re either burning green with envy or drowning in the blues – it seems we cover most of the color wheel. We should not beat ourselves up over reports of love we see on the Internet; rather we should search for the silver lining. That true love is real, that you deserve it, that you should take this energy and windmill it into your wedding planning, because it is no wedding of your dreams if it has no strength to prop it up. Young couple Erica Harris and Arte Vann has that kind of energy and it will surely result in one heck of a wedding. Here’s the interesting thing about this couple: They found love on Instagram. Erica said yes – that should be no surprise; if she said no, there would be no news story, just a heartbroken man who made a 3,000-mile journey into rejection. Many people might question the validity of their love, the realness of it; after all, they fell in love on Instagram. They weren’t high school sweethearts. They didn’t meet on a magical night in the summertime. They weren’t best friends who suddenly realized they were in love. They were merely connected by cupid Wi-Fi and the story unfolds from there. That energy is what makes for a great wedding, when a couple lets loose and lets their hearts move the way hearts should move. As a rabbi who has officiated many weddings over the years, I can attest to the fact that a positive energy is what separates an average ceremony from a truly great one. I wish Erica and Arte the best of luck! Posted February 1, 2016 by Rabbi Lebow & filed under Atlanta Weddings. Over the years providing wedding rabbi services for all ceremonies, I have come across many different types of people in this world. Some are more romantic than others are. Some believe in the power of love. Others are more realistic, prone to acting with their head more so than their heart. That is fine, because no two of us are alive. That is why the world is a beautiful place so we should get in the habit of embracing our differences. That is one of my main missions when I work with a couple – bringing out their beautiful differences. If only couples would feel the same way! Nowadays couples put too much pressure on themselves when it comes to wedding planning, with many constantly scouring social media sites like Pinterest in order to find the wedding look that “speaks” for them. This is when the stress starts to build – no dam in existence can hold it all back. The thing that I have learned after all these years is to be comfortable in your own skin and your wedding, however you want it to be, will be the perfect wedding for you and your partner. Meghan Demaria of Refinery29 learned all about it when planning her own wedding. That is ridiculous; nothing killjoy about who you are as a person. Wedding planning can bring out the best or the worst in a person. If you read the article in full, which I recommend you do, you will see that Demaria is not a big fan of wedding planning, but it has made her a better person: She has figured out who she is as a person and what she wants out of life. Even if that knowledge does not have all the answer, Demaria is still in a better position than she was a year ago. At Atlanta Jewish & Interfaith Weddings, I believe that wedding planning (in addition to the ceremony and reception) should bring out the best in a couple. As your wedding officiant, I will do everything in my power to make that a reality. Contact me today for more information. Posted January 25, 2016 by Rabbi Lebow & filed under Atlanta Weddings. It seems like we were just coming up with our resolutions for 2016 and for those of us unlucky in love or battling severe loneliness, the resolution process was a simple one: Find love by any means necessary. Well, while that is certainly a worthwhile resolution, our dedication to changing ourselves will be facing a difficult challenge in the coming weeks, especially if it involves finding love. Yes – I am talking about Valentine’s Day, which will be here before we know it. Despite the pressure that you should not be alone on such a magnanimous day, you should be a bit pickier at who you decide to date and let into your life. This is sound advice no matter what time of the year, but quite more pertinent on the day of candy grams and flowers. Thankfully, that is the purpose of dating apps, to help thin the herd. Gareth Rubin of The Guardian believes so. That language might seem a little too harsh; using a term like undesirable, but it makes sense. After all, why waste time with someone who could never possibly receive admin access to the login of your heart? You want someone you feel you can immediately build something great with and although that might sound unrealistic, we should aim for the skies when it concerns matters of the heart, not roll around in the dirt. To accomplish this, dating apps are now more selective than ever before. Apps like The League or Britain’s The Inner Circle are bringing together communities of high-achievers and ambitions trailblazers. These apps hope to connect lovers on things such as academic achievements or employment history. Regardless of what how you feel about dating apps, there is one is just for you – and when you do find love, look to Atlanta Jewish & Interfaith Weddings to help you progress to the next step in your story. Posted January 14, 2016 by Rabbi Lebow & filed under Uncategorized. Can love save the world? It is a nice thought, one that humanity has been having since the dawn of time. In other words, can love and passion connect people like never before or is that all a pipe dream brought about by movies or the naïve hope we have hidden under the floorboards of our minds and hearts? That might be the trick to saving the world. By keeping love in our hearts at all times, there is no chance that the world will be a sunless garden. At the very least, it might be sunnier although it still might have a couple dead flowers. Maybe we can use love to clean up the dead flowers. That was the goal of a recent viral video put out Time Out Tel Aviv. Of course, there is nothing wrong with falling in love with someone different or being scared of governments, so Time Out Tel Aviv brought together couples, friends, strangers, and others to make out in front of the camera, the one catch being that each pair had to contain an Arab or a Jewish person. So far, the video has garnered more than 300,000 views. You can view it below. Posted January 8, 2016 by Rabbi Lebow & filed under Atlanta Weddings. Now that 2016 is here, every one of us is determined to make the New Year as successful as it can possibly be. We wake up on January 1 as determined as ever, willing to do whatever it takes to be a new person, putting in the hard work to better our lives and the world all around us. Whatever you didn’t have in 2015 you want in 2016. Whatever you failed to accomplish in 2015 you will accomplish in 2016. For some of us, that means falling in love, finding that special someone to share your soul with, someone that will help you transform your heart into a bounce house where feelings are constantly bouncing up and down. A different, more interesting edition of ourselves? Isn’t that why we make resolutions to become different and more interesting? Of course, that’s what they are. So love improves us as humans – that much we can agree on. That is why people get married, to have a permanent, soulful agreement be better people or, at the very least, to always be striving for that. Experiencing true love isn’t the hard part; finding it is, which explains all those dating websites popping up all across the inter webs. 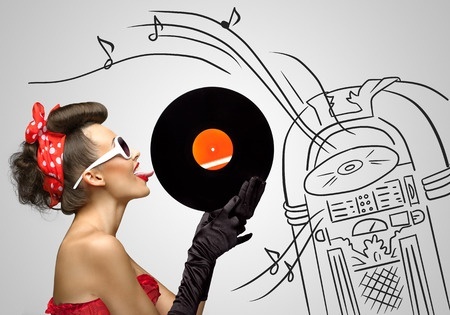 One such site that is making an impact is Tastebuds where you can meet new people who share your taste in music. Is music that important though? Many things connect two hearts together and music is one of them. At Atlanta Jewish & Interfaith Weddings, I have seen people bond over music. Sometimes the music of our souls responds to literal music. What is always on rotation in the jukebox beating inside you? Maybe you need to simply open up your ears and listen to the world around you. Maybe you will hear the music of falling in love. Posted December 27, 2015 by Rabbi Lebow & filed under Atlanta Weddings. Another day, another night, another article about finding love. For some, this means finding love again. With all these articles and tips on how to find love, you would expect that the heart is like a fabled city of gold or something, as if love was born from legend and transformed into myth. I would like to inform you that love is no myth; it is definitely real, something tangible, something you can touch and, if you are lucky, hold. Why then do people feel that love is so elusive, like Bigfoot? Maybe it is because the world forces it into us at an early age that love is something to strive for, something that we all deserve. This puts a lot of pressure on us, especially around this time of the year, when it seems like the sky is giant mistletoe and everyone is kissing under it except for you. It can be rough, but not all hope is lost. You have to try to understand that you are not alone in feeling this way. Others feel as you do and that means you have to exhibit empathy and compassion. Despite her almost two decade marriage, Deb was still lost when it came to the crazy world of love, proving that no one is that skilled when it comes to matters of the heart. Viewing dating as a mindful practice, akin to something that is religious is a fascinating one. 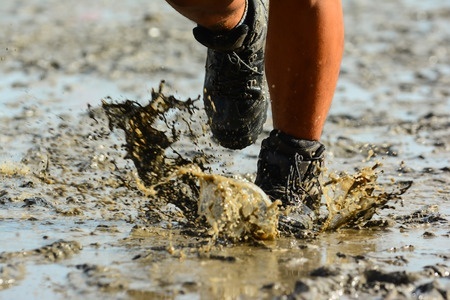 You have to meditate through the muck so to speak and around this time of the year, there is a lot of muck.